Many men simply don’t want to use an electric shaver ,as they prefer the classic safety razor. 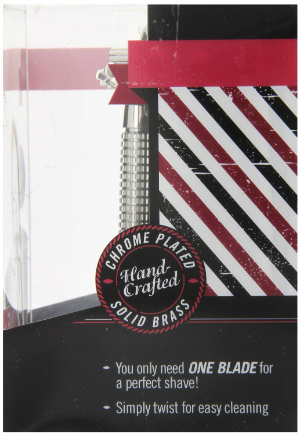 The Micro Touch Razor is made from solid brass with chrome plating, and has been handcrafted for quality. 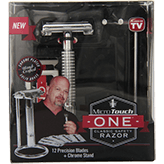 It provides a way for men to continue using a classic safety razor when they don’t wish to purchase an expensive men’s electric razor. 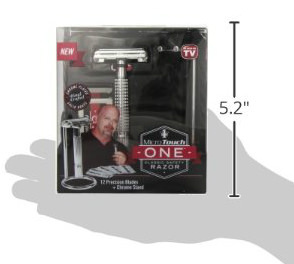 In the package is also a chrome stand, so the razor can sit neatly out of the way on your bathroom counter, and can also be allowed to properly air dry. 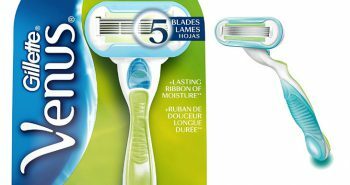 Besides the handle there are twelve precision blades included in the packaging. 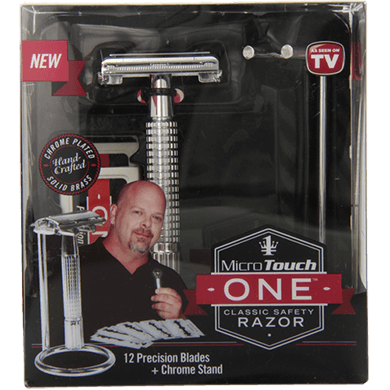 The Micro Touch Razor is a classic product that has been given a modern update, making it safer to use, while leaving the face nice and smooth. You will only need to use a one blade or men’s traditional safety razor in order to have the best shave possible. You can shave dry for a fast shave, or shave with warm water in the sink or shower. You can also use shaving gels, foams, lotions, creams, or soap, which will enable the razor blades to more smoothly flow over your skin, without nicks or cuts. And the purpose of the lotions and gels is to also prevent any itchy or painful razor burns, or a red rash that can sometimes occur after shaving. It’s simple to clean this safety razor. You only have to give it a twist and then rinse it under a warm running tap to get out the tiny hairs, or any sort of shaving products you have used. Shake out the excess water, pat dry with a towel, and place in the chrome holder. Ensure that you don’t let the razor just sit in water on your counter, otherwise it may rust. Proper care will ensure that it lasts several years. All you have to do is replace the blades on a regular basis. You have twelve in the kit and can order more as required. A safety razor is also the perfect solution for a man who has some facial hair, as it can be difficult trying to trim to your favourite beard or moustache styles with a cordless shaver. The Micro Touch is small so it can get around the curves of a man’s face, and leave hair where you want to leave it. 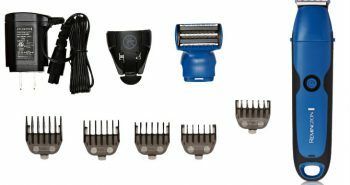 It takes the guesswork out of shaving and trimming your beards, unlike a heavy electric shaver where you might make a mistake. 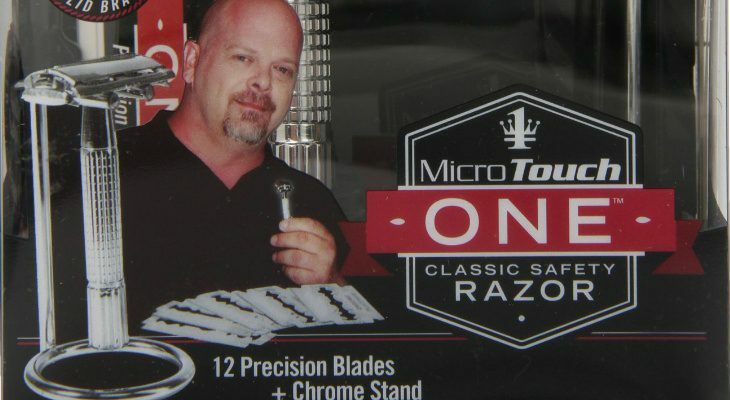 The Micro Touch Razor set costs under $12, making it extremely affordable for everyone to own, even for men who already own an electric shaver and may wish a backup safety razor for touch-ups. The entire package measures 3.5” x 4.5” x 5.3 inches, and weighs 6.4 ounces. 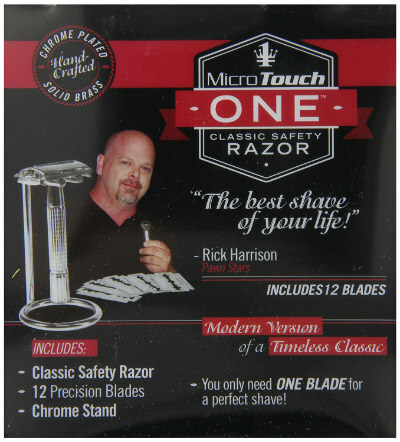 The Micro Touch Razor reviews are 3.5 out of 5 stars, for nearly 1700 reviews. The package has a clear plastic front, with red, black, and white graphics and a cardboard backing. 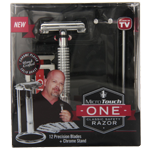 If you feel you still need a traditional men’s razor blade, the Micro Touch Razor is an affordable option. 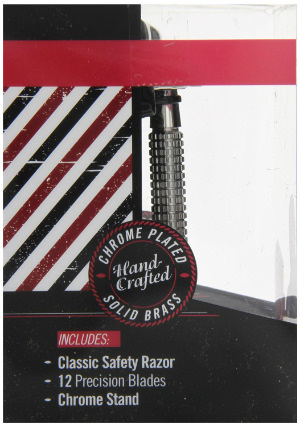 The chrome coloured handle will look great on your counter, and you’ll be confident you’re purchasing a quality razor, and not one made from plastic. This is also a great option for when you need to travel.